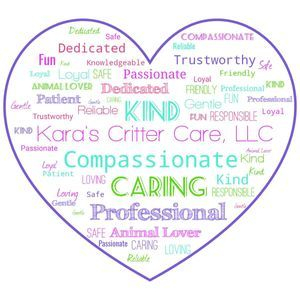 Welcome to Kara's Critter Care where we pride ourselves in our friendly, dependable pet care in the comfort of your own home and dog walking for extra exercise for your best, four legged, friend. Now Accepting Credit Cards through our Time To Pet software. Your pet stays where it is most comfortable, so there is less stress. You don't have to drop the dog off at a kennel. No exposure to other pets that may be carrying a disease. No imposing on family or friends. Your vacation can be guilt and worry free knowing that an insured professional is taking good care of your pet. Do you need someone to help with getting your dog walked when you can't? You have a busy schedule that doesn’t allow time to walk your dog. You are physically unable to walk your dog yourself. Your dog has too much energy and is hard to handle. Your dog needs to walk off a few pounds. You have a new puppy that needs more potty breaks than you can take care of. Do you need someone to help care for your pets while you are away? You are taking a much needed vacation. You are travelling on business. Your children are in sports that require you to travel. 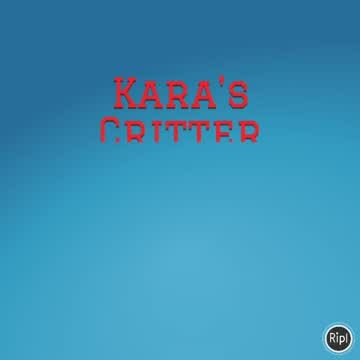 Kara's Critter Care understands how it feels to worry about your pet when you work long hours or when you just wanted to enjoy a vacation. We have been there with our own pets. That is why we are here to help and we care about your pets as much as you do! Fully Insured and Bonded through PSA. Kara's current pack. Raider, Felony, Pepper, and Thunder. This was Kara's pack. From left to right: Cookie (2/1996-11/2011), Griffan (5/1998-10/2012), Raider, and Pepper. Must be within 10 miles from me. (Temperance and Jackman intersection). 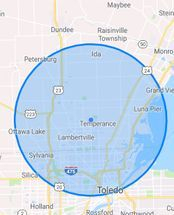 Note: This map shows the radius of the locations I serve. Some cities I serve may not include the entire city. © 2019 Kara's Critter Care, LLC. All Rights Reserved. Affordable dog walker, Temperance, MI. Dependable pet sitter, Monroe and Lucas County. 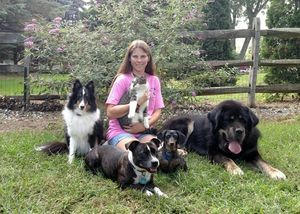 Private puppy and dog training, Lambertville, MI.